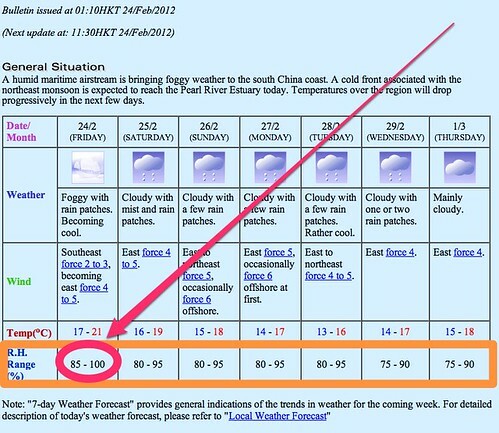 During spring time (yes, it is getting there here in Hong Kong) the temperatures show a rising trend again. They can bounce up and down as can be seen in the picture above, though it gradually increases. With that, the relative humidity definitely goes up and for months it will hover in the higher regions. Think between 80-100%. Some of the effects are that your laundry won't dry for days, condensation all over the house and dampness of clothes and bedsheets for example. Of course, as soon as you get outside, you feel sticky and sweaty already. Even some long term effects can be seen on books (turning yellow or show mold). A remedy is placing of dehumidifiers - shops in town sell lots of small little boxes filled with chemical stuff that absorbs the humidity. Obviously, leaving behind a massive trail of waste as most of the boxes are on time usage only. A better solution I believe is using electric dehumidifiers as they have a good capacity and are stronger as well. And indeed.. Groupon Hong Kong has had some deals coming through already.